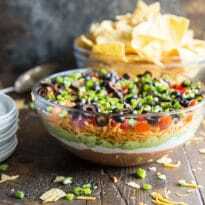 This 7 Layer Dip recipe is made with beans, sour cream, guacamole, cheese, tomatoes, olives, and scallions. It's easy to make and always a hit at parties! In a small bowl, mix the beans and taco seasoning mix. Spread in the bottom of a medium bowl or square baking dish. Halve avocados, remove the pits, and scoop out the flesh. In a second bowl, mash avocados and add guacamole seasoning mix. On top of the refried beans, layer the following ingredients in this order: Sour cream, guacamole, shredded cheese, tomatoes, olives, and scallions. Serve immediately with tortilla chips or cover and chill until serving time.